My wife, Melissa and I are pure Cajuns from south Louisiana. We currently reside on Toledo Bend Lake in northwest Louisiana. We both enjoy most music and lets face it, music is a necessity while driving. On the top of our list is Cajun and Swamp Pop. How did y’all get into the expedite industry? Prior to our start in the expedite world, I was in the oilfield and Melissa was a Respiratory Therapist. With the downfall of the oilfield I started to pursue different fields of interest. Trucking caught our attention right off! We could work together, get to see the beautiful country we live in and provide an income. After completing CDL school we drove tractor trailers for only a short time. It was then that we had the opportunity to meet an incredible fleet owner, Susan Medlin. We quickly realized that team driving a straight truck was our calling. I mean really, it’s a condo on wheels! 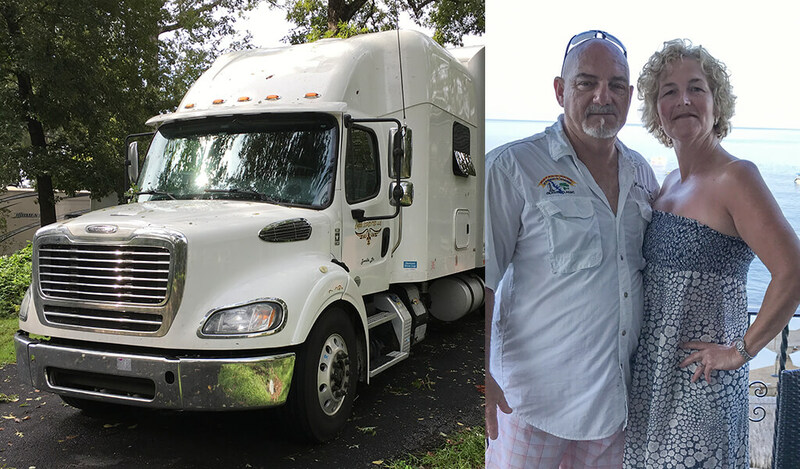 Our journey in expediting was wonderful and we figured that becoming owner/operators was an option for us. So, in May 2017 Cajun Expedited was born. It just seemed fitting for our heritage to become a part of our company. The following month we became the proud owners of our first straight truck! Just as we were becoming comfortable with being Owner/Operators, another door opened for us to pursue fleet status with a second truck. Who do you run with, how has your experience been, and how long have you been with this company? With our plans to expand to fleet status, we began doing research on different expedite carriers. Jeff Curry with Premium Transportation Logistics was highly recommended due to he and Jim Welch’s history in expediting. Our main interest in PTL was their “re-building” status. We made the decision to grow our company with PTL. Although we have only been with PTL a few months we are satisfied and already feel at home! What recommendations do you have for others in the industry trying to do what you do? First, setting goals and researching all avenues with 100% determination is essential. Next, always expect the unexpected bumps in the road. We had an incident with a deer in our first month as owner/operator. It was very discouraging, but we managed. A couple months later, Melissa had emergency surgery and was out 4 weeks. This could have been a major setback had we not been prepared.